Abbie Fox is a busy mom of a three and the owner of Foxy Photography. She's a passionate parent and an artist who tells stories from behind the lens, and now, she's using her medium to bring attention to a topic that so many mothers have stories about: mom-shaming. 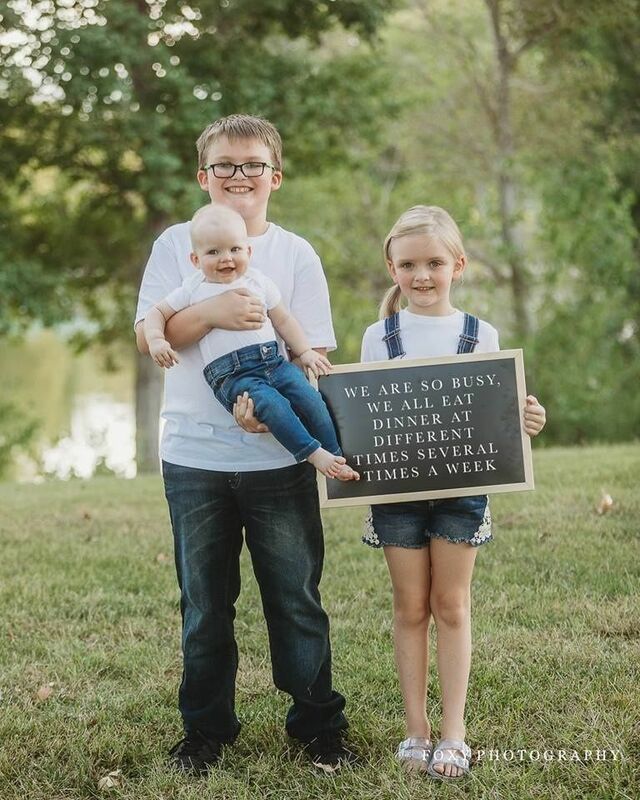 Fox uploaded a series of portraits of children (her own three—8-year-old Maverick, 6-year-old Georgia, and Millie, who is 7 months—and clients' kids) posed with signs spelling out messages about "hot button" issues moms are often shamed for, like sleeping, feeding, and the decision to work full-time. The photo series, which has now gone viral, was a passion project for Fox, who knows how it feels to be judged by others when you're just trying to do your best as a parent. "I was shamed for a lot of things, especially the feeding part," Fox tells Motherly over Facebook Messenger, explaining that when she was a first time mom her oldest, Maverick, had a hard time latching to nurse. For six weeks the family struggled, seeing doctors, nurses and specialists, and Fox cried herself to sleep at night. "I was being told that I wasn't a good mother [unless] I could breastfeed him. And this was actually coming from people I thought were my friends," she explains. Fox had more success breastfeeding her next child, and nursed for three months, but it seemed there was always something else for people to be judgmental about. "I also got shamed for allowing my kids to watch TV at a young age, I got shamed for being a working mom and then when I became a stay-at-home mom, just running this business [I] got shamed for that as well," she says. So the photography series, "Anti Mommy Shamers Unite" was born out of the frustration of being shamed for her parenting decisions when (like all of us mamas) Fox is doing her best, and doing what is right for her family in her circumstances. 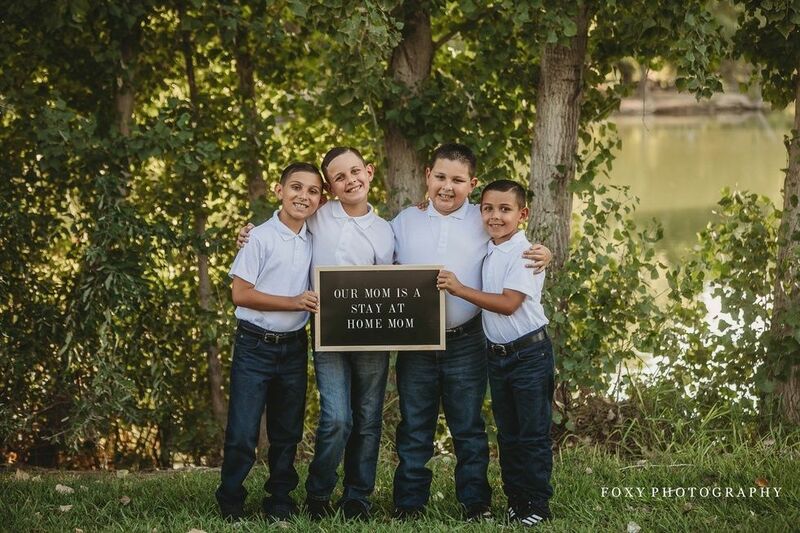 She posed her three kids with a sign noting that they don't often eat dinner as a family—something Fox has taken flack for but refuses to feel bad about. Another photo of Fox's oldest is sparking perhaps the most controversy of the 37 portraits. 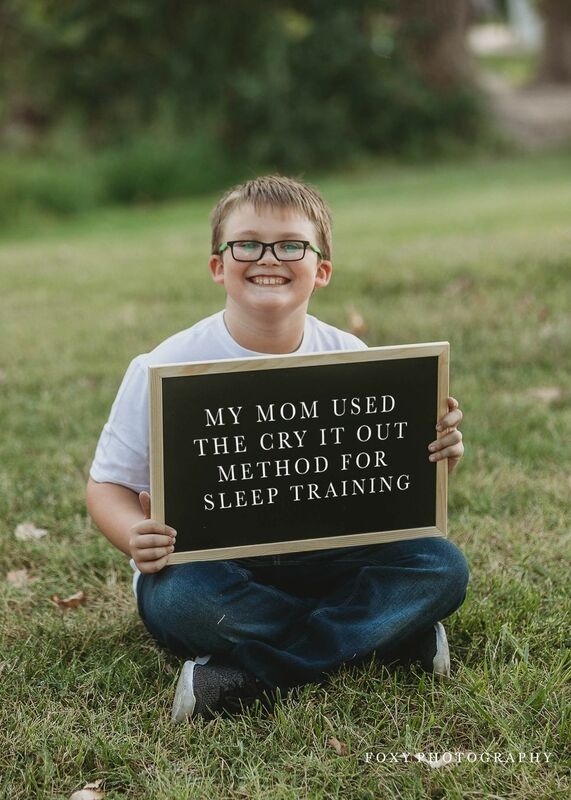 In this one, Maverick poses with a sign reading: "My mom used the Cry It Out method for sleep training." Fox believes parents should be able to talk about different approaches to parenting without putting each other down. But in training her camera's lens on mom-shaming, Fox has found herself in the eye of a major shame storm. "I've actually been getting nasty comments, Facebook messages, and emails that I am promoting child abuse by having that picture," says Fox, who isn't suggesting that CIO is for every family, just that it worked for hers. 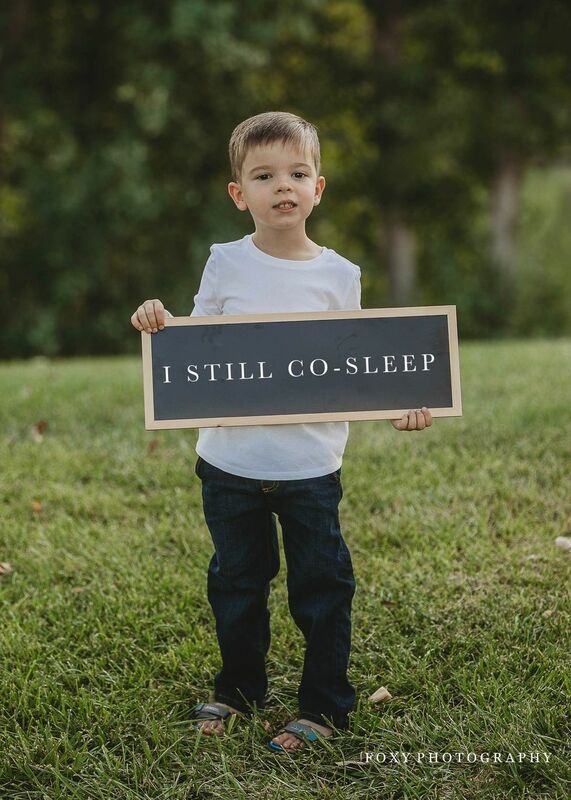 She's supportive of whatever way parents choose to deal with sleep in their own homes, as is evident in some of the photos she captured of her clients. 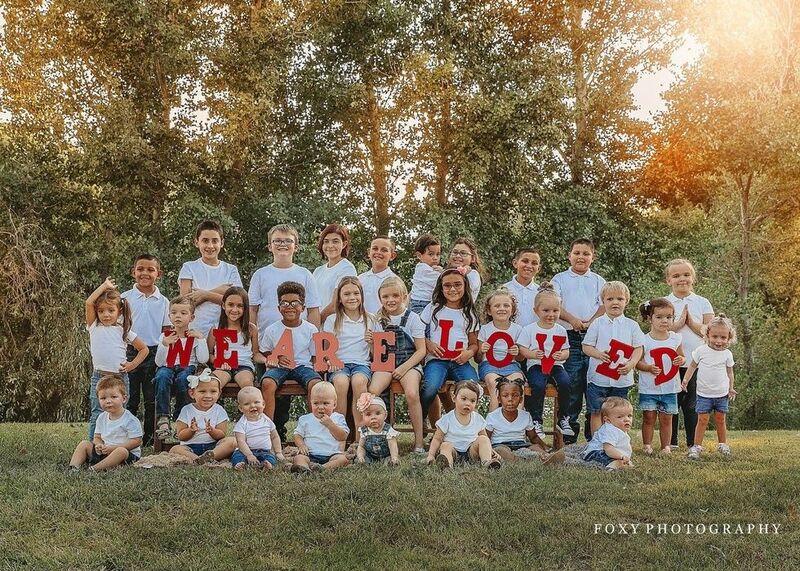 Unfortunately, Fox tells Motherly her clients have been dealing with some nasty messages as well, due to the messages in their children's portraits. Shauntelle Yount and her son participated in the photo shoot because she was always told that co-sleeping was some horrible thing, but it was what worked for her family. "My son was 9 weeks early and had many problems. After he came home from the NICU I decided co-sleeping worked for the both of us," Young writes. "I stayed awake for days just to make sure he wasn't going to stop breathing. Co-sleeping let us both get the rest we needed and if there was a problem I was right there to fix it. As mother's we need to stop placing shame and start standing up for each other." Johana Decker's kids posed with signs saying that their mother used a safety leash on her toddler and doesn't stop tantrums. 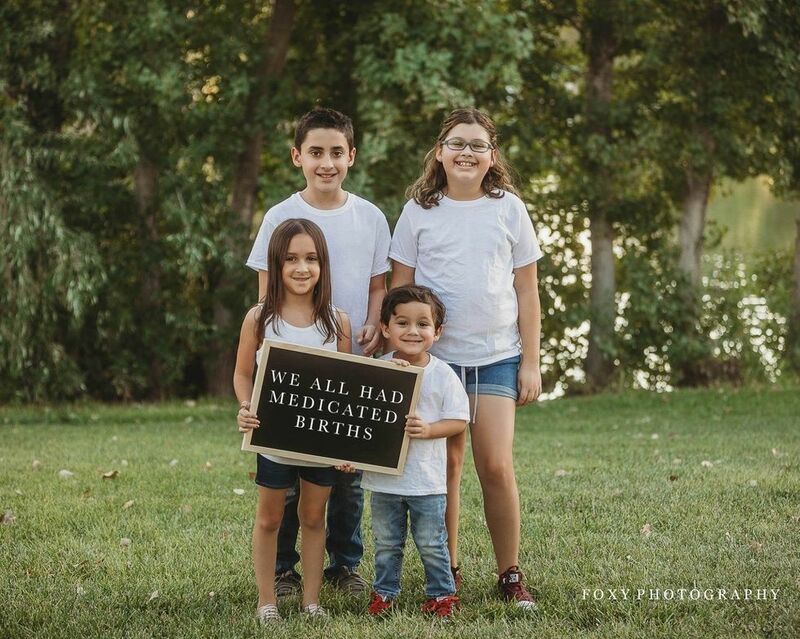 Together, the girls posed with another sign about their births, a choice many moms are shamed over. 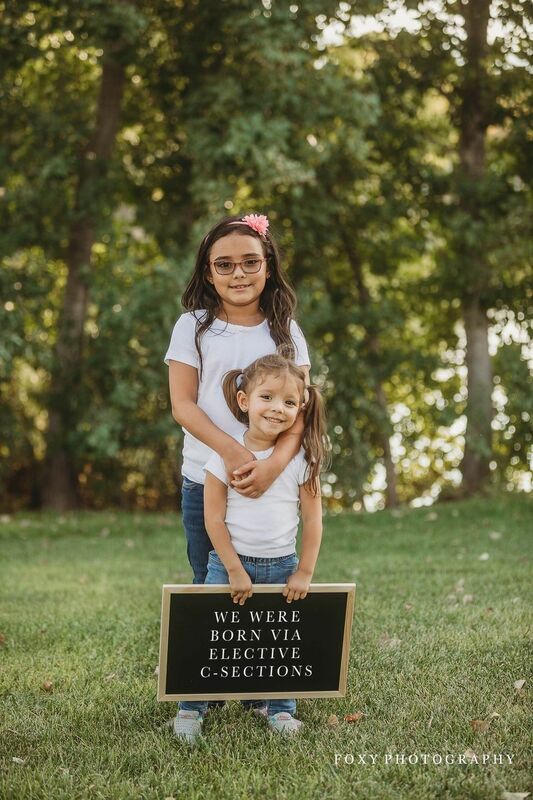 "We decided for 2 elective c-sections because we were impatient to see how long labor was going to take, didn't want any disturbance to the lady bits and [were] maybe a tad bit scared of labor so major surgery seemed a better choice.............TWICE!! 🤷♀️🤷♀️," Decker wrote. She continues: "My oldest would run away from me to explore the world that the only way I could turn my back on her to grab my keys, my purse, my mind etc was to leash her up." Sara Martinez is another mother who feels birth decisions should not be judged. "My parenting choices are my own. I don't expect others to follow me and I don't want to be expected to follow others. I'm an over thinker and take a lot of time to make decisions and research information when it's needed and then I make the best choices for my family based off of that. I believe other parents make choices that are best for their family as well. If it has no impact on anyone outside of my home, it shouldn't be judged or up for debate by others. My kids are happy, healthy, well cared for, and we are doing everything we can to live our best lives possible!" she writes. Lakilah Bailey made a different birth choice, one that was right for her and her daughter but judged by others. "I personally was shamed for several choices that i have made over the years. The most controversial one was my choice to have a home birth. Friends and family would call me crazy, tell me I was a hippie, say i didn't care about my child's safety, etc. At the end of the day, I knew it was the right decision for me. However, I did wish I had more support and less shaming during such a joyful time in my life. People tend to shame others because of their own lack of knowledge. As a mother, I have learned that we are all out here doing the best we can for our little ones. No mother deserves to be shamed for doing what she believes is the best for her child," she explains. A lot of mothers feel judgment over not giving their child breastmilk, but some are judged and shamed even when they do. Abby John exclusively pumped for her baby, but found a lot of people were critical of her decision not to nurse. "It was super important to me personally to give him my milk at least for his first year," John writes. "I was having such a difficult time getting Carson to latch that this was the next best thing so that he could still have it. 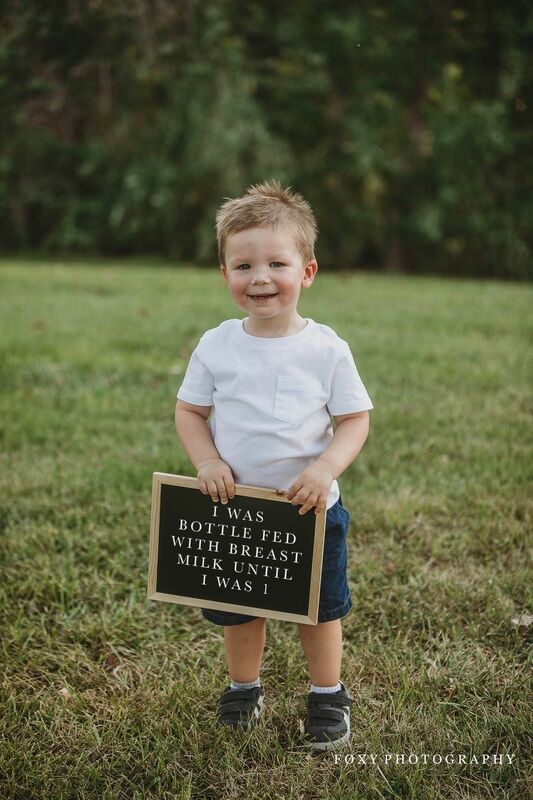 People told me it wouldn't be the same type of bond but Carson and I have an amazing connection and I am so happy that I was able to provide him with this." Whitney Rae Hoskin says she wanted to participate in this shoot because after she had her daughter there were people who "couldn't believe that I was working and not taking care of my baby," she writes. 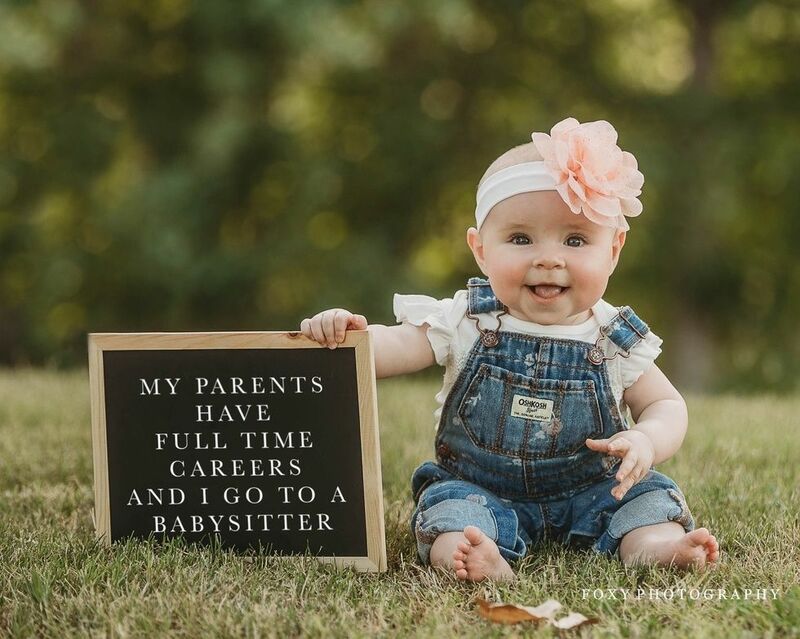 Hoskin continues: "My husband and I made the decision that we were both going to continue with our careers and have our good friend be Nora's babysitter. 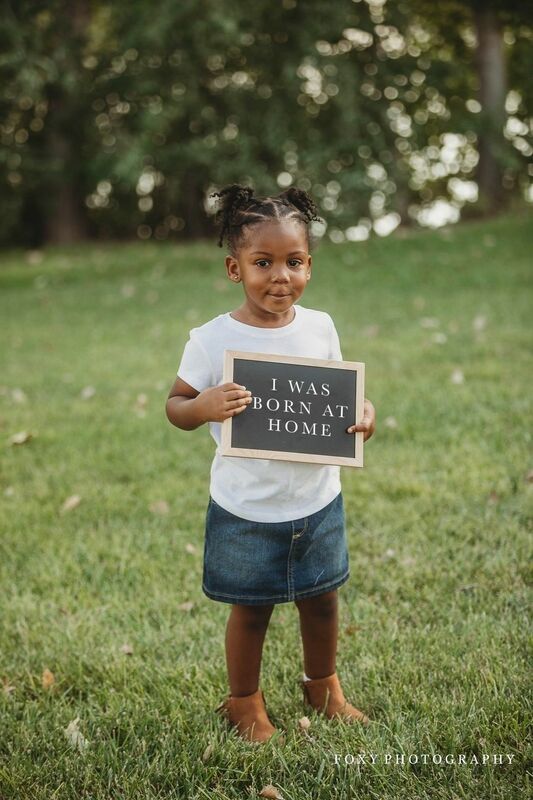 This has been such a blessing for us because Nora gets to interact with other children around her age and that greatly helps with social development and motor skill development." She says it is "important for people to know that we as parents are making choices for our children that are good for us and that work for our family and our situation." "Let's face it, parenting is already hard," she explains. "The judgment of others around you shouldn't have to contribute to the craziness we already face." Desiree Deittrick Perdichizzi's boys posed with signs about hot topic issues like ADHD and essential oils. She says "being a parent, a mother specifically, is so hard and even more so with endless judgment or shaming that goes on." "And I feel that, mother's specifically, need that support which can bring a feeling of peace to their lives instead of the fear, doubt, insecurity or shame that the judgment fuels. We (mothers) question and judge ourselves enough as it is. We are our own toughest critic. We don't need to be told what we chose or what we do is wrong or how we should have done it better - we need to be told and reassured that we are doing ok and that we are enough," she writes. No matter how you feed your baby, how you put them to sleep, whether your baby watches TV or has never looked at a screen, we can all agree that we are trying. One mom's best may look different from another's, but it's her life, her child and her choices. And those choices (while they may not be the ones we would make) are made from a place of motherly love. That's what Fox sees when looking through her camera, and that's what she wants us to see when we look in the mirror. You're doing your best, Mama, and there's no shame in that.